Time’s ticking. It’s getting down to the wire. My sister’s wedding is around the corner and there are tons of little details to perfect. At first, she called my dad “the bridezilla” and now it seems like that label has been passed down to me. The bride, herself is fairly calm and collective. My father, me, and my oldest sister? Another story. Operating on wedding mode, I’ve lost sleep and wedding stuff is ALL I think about 23hrs/day. The other hour is dedicated to Zoey. On the brighter side, at least it’s not my wedding b/c that event was the most exhausting thing me and my husband have ever experienced. Of course, we enjoyed our day but the weeks leading up to the big day were pure chaos. This is because I’m quite a perfectionist and my husband? Much more of a perfectionist than I can ever be. Imagine, us two together. YIKES. 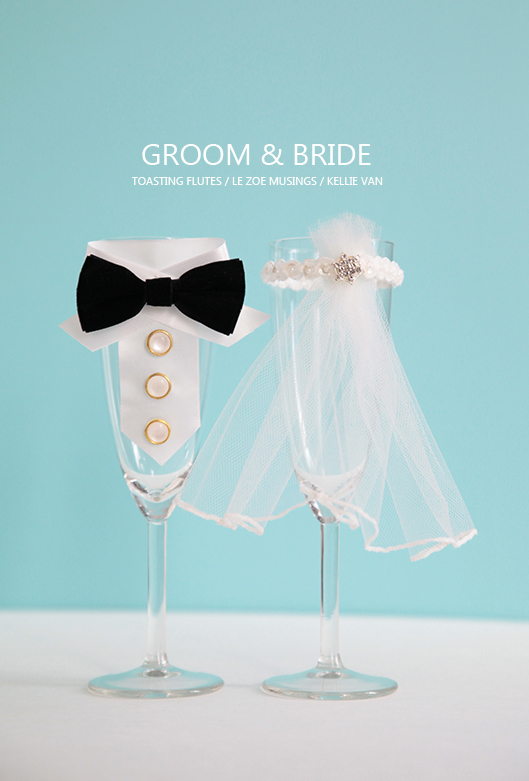 Anyhow, I just finished making the bride & groom toasting flutes and want to share. I’m sure you’ve probably seen this project floating around the web (that’s how I got the idea). It’s really simple but makes such a unique impact. Another project to check off my ridiculously long to do list! Using the ribbons, make the shirt collar, shirt, and bow tie as seen above. Using a glue gun, glue all the pieces to the flute. My groom is looking pretty sharp! Again, use a glue gun to glue all the pieces to the flute. Getting married or know someone who is? Share this fabulous wedding project with them! Want more wedding ideas? Follow me on pinterest. can you explain how to make to bow tie please? Cute idea. I would like to implement on your idea on the wedding ceremony of my best friend “Roger”. Love this! Would you mind if we used/suggested this idea to our clients? I think it’s adorable! Very sweet! Less than 3 months until my daughter’s big day- perhaps I will make these for part of her shower gift- thanks for sharing! Gosh these are just stunning! And you are so talented. wow~ I didn’t know there was such a project floating around… we have been doing it for our annual gatherings whenever we need toasting flute, so that it suits each theme and character. Luv it Kellie! Great idea! That is fabulous and will come in handy! So adorable. 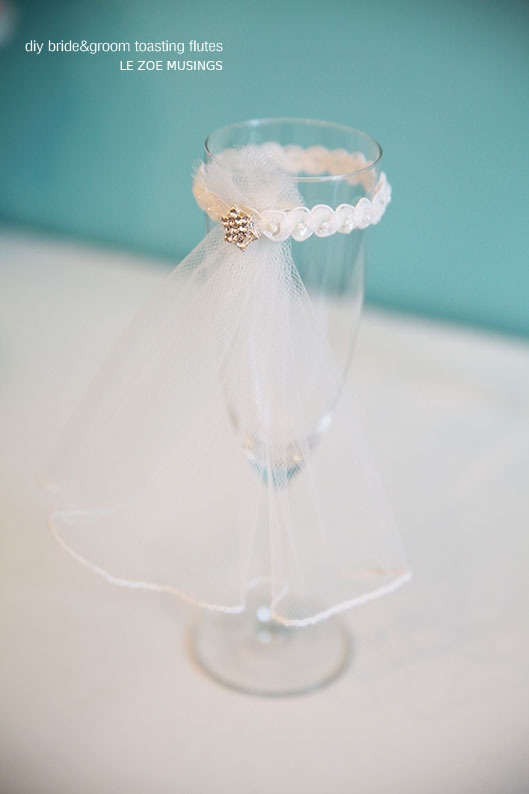 These flutes are fantastic….such a great idea to make them stand out…. So cute! My friend is getting married next year. I’ll have to tell her about these! Beautiful job, Kellie!! This will definitely make your sis’s special day extra festive!! Those are so lovely and unique!!! For bride-to-be Jess, have a read! !